From the heart of the most loved Philippine theme park Enchanted Kingdom (EK), feel the magic of love throughout the month of February. Week after week, EK brings enchanting treats for everyone who wish to feel, hear, witness and share love this season. 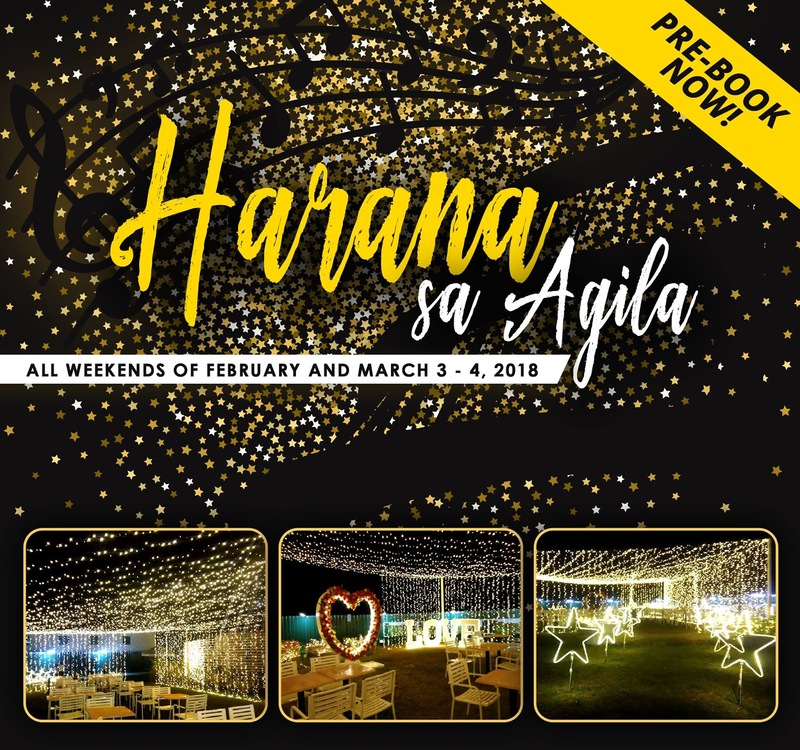 EK’s February weekends really overflow with love as couples, friends or families are offered yet another EKsclusive dining EKsperience in Harana sa Agila. 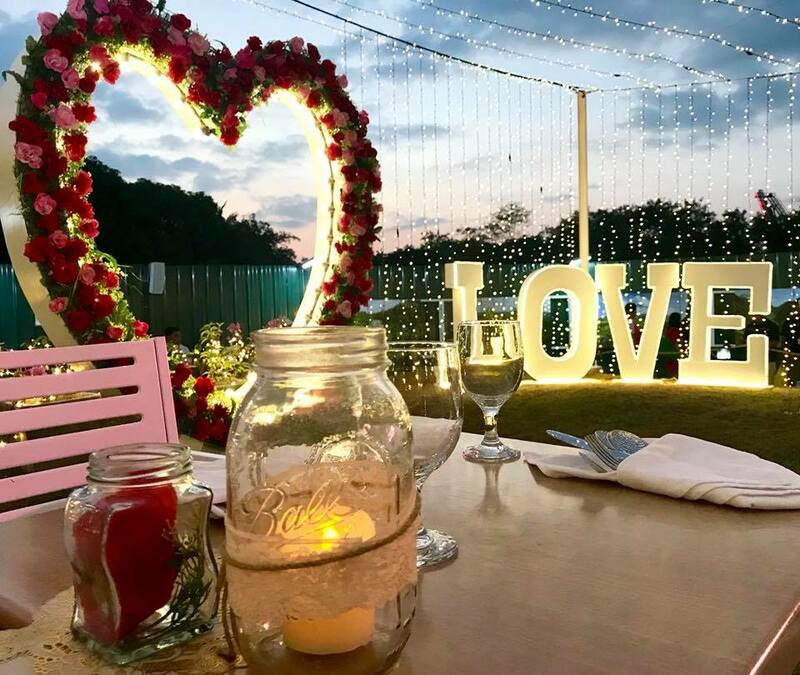 The Agila grounds will be the special garden setting for this weekend dining, al fresco style. 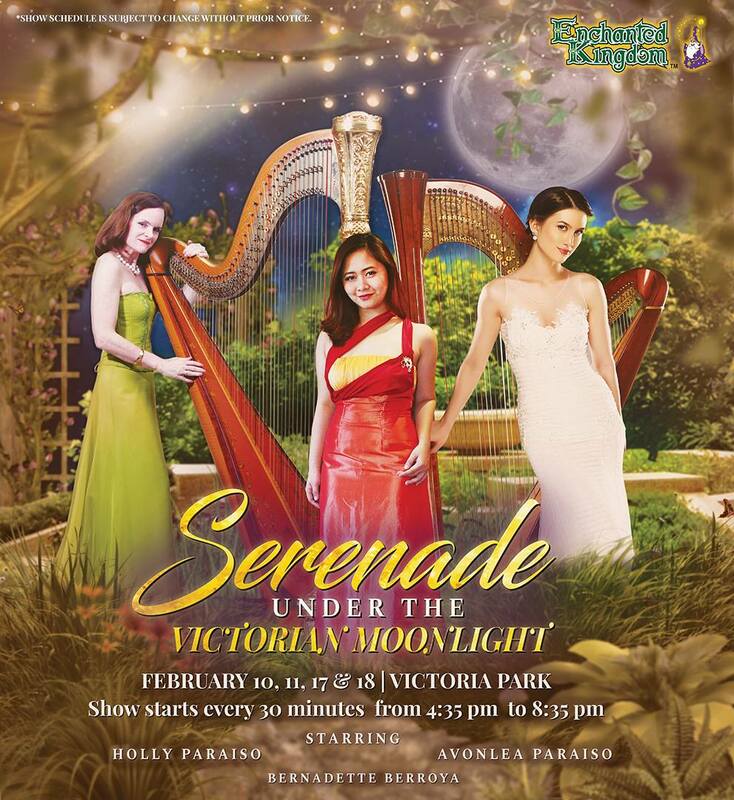 Enjoy the musical acoustic serenade with a picturesque ambiance under the stars. Smile for a photo and bring home a souvenir, all compliments of EK (inclusive of Reg.Day Passes). 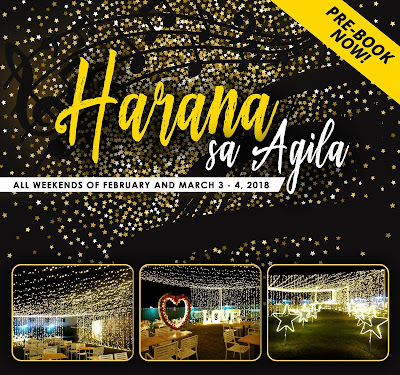 Harana sa Agila is offered on Saturdays and Sundays from February 10 to March 4 only. Couple package is P2,500 and Group package (good for 4) is P 4,800 only. 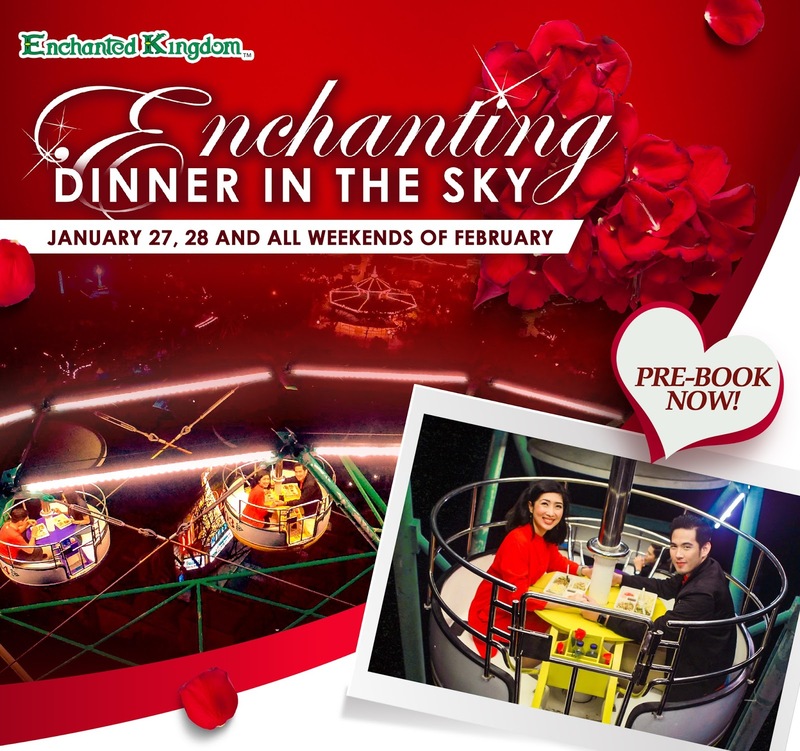 Love fills the air anew with Enchanting Dinner in the Sky, EK’s unique spin on a romantic dinner date high above the Sta. Rosa skyline. Couples and small groups will be treated to a most memorable meal aboard the Wheel of Fate through all weekends of February. This towering ride is the perfect spot to spend quality time enjoying nothing but great company, great food, great music, and the greatest view! 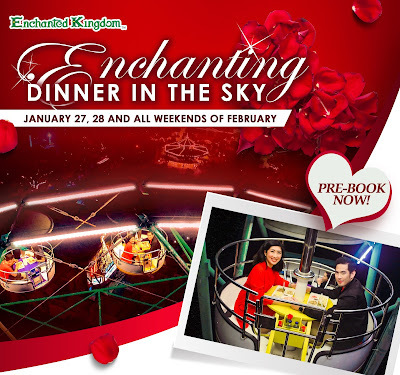 Enchanting Dinner in the Sky has Couple and Group Packages for four for very special rates to make your Valentine weekends truly magical. Couple package is P1,700 (P2,100 with Agila) and Group package (good for 4) is P3,300 ( P4,000 with Agila). If you plan to have a memorable date with lots of music and dancing, then look no further because EK’s annual Hug-A-Palooza makes an EKciting comeback! This post-Valentine Concert brings together three girls with one dream who call themselves, One Song. 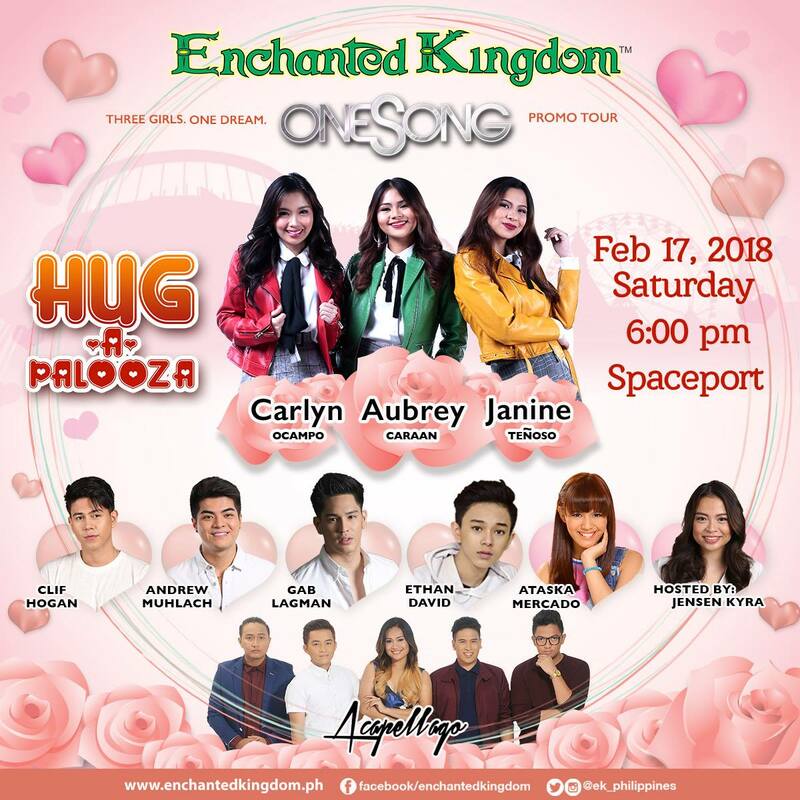 Catch the live performances of One Song’s Carlyn Ocampo, Aubrey Caraan and Janine Tenoso, plus guest artists Clif Hogan, Andrew Muhlach, Gab Lagman, Ethan David and Ataska Mercado. Hug-A-Palooza will happen on February 17, 6pm at the Spaceport and is brought to you in partnership with Viva Entertainment. 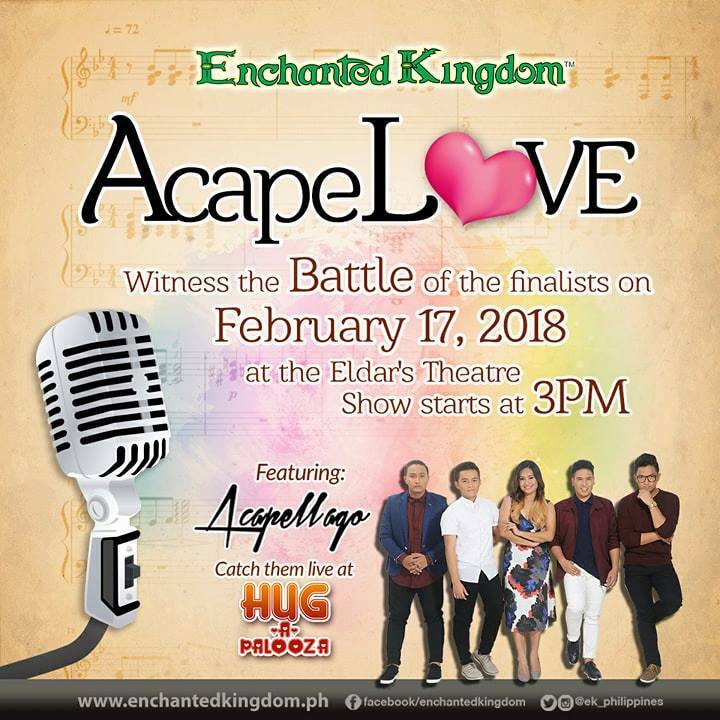 February 17 also marks the AcapeLOVE Competition, a venue for talented groups to sing their hearts out for prizes and bragging rights, Acapella style. Groups must impress the judges comprised by renowned vocalists, Acapella Go, with a repertoire of three love songs and an OPM hit. 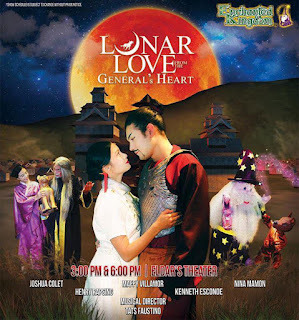 Capping off the Valentine month and Chinese New Year celebrations with flair is an EKstra-special Enchante entitled Lunar Love from the General’s Heart, showing at the Eldar’s Theater And lastly, EKsperience a magical Serenade Under the Victorian Moonlight this February 10, 11, 17 and 18. Truly, there are more than enough love-filled reasons to head over to Sta. Rosa, and EKsperience the season of love at Enchanted Kingdom… The Magic Lives Forever. poster images and words provided for by Enchanted Kingdom.